Old Palm Golf Club is recognized as the premier private Club community in The Palm Beaches, but not everyone seems to know all of the reasons why itâs so revered. While the extraordinary lifestyle instantly comes to mind, thereâs another distinguishing factor that more and more homebuyers are discoveringâthe Old Palm lifestyle is within reach. âThereâs a real value story here at Old Palm Golf Club,â says Connie McGinnis, Director of Sales, âwhich certainly contributes to our Old Palm being the leading Club for new home sales in The Palm Beaches. When people come into our sales office and discover what they get for the price they are pleasantly surprised, astonished actually.â The fact is that homes in Old Palmâs magnificent Golf Estates neighborhood start at $1,196,000, a spectacular value, particularly in light of the recent spike in real estate prices throughout Palm Beach County. Even so, new home prices within Old Palm have remained consistent, making its extraordinary lifestyle surprisingly attainable. Homes in the Golf Estates range from approximately 3,400 to 5,000 square feet, an ideal size for those who prefer a certain intimacy and proportion without sacrificing even the slightest measure of comfort or exclusivity. The homes are also noted for the variety in their designs, styles and views, as all of the residences in the Golf Estates are situated on quarter-acre home sites overlooking the preserves, private water features or golf course. Several beautiful models in the neighborhood are available right now, ready for move in. For instance, Mustapick Estate Homes is offering three distinct models on three consecutive home sites. The 3,409-square-foot Martinique, a British Colonial-influenced design aimed at those who want a slightly smaller layout, features three bedrooms, three full and one half bath, a den and family room. Thoughtfully designed with a minimum of hallways, the Martinique uses the extra space to expand the other rooms. The interior is bright and open, compliments of the abundance of windows. When built on a preserve home site, the Martinique starts at $1,196,000. The largest Mustapick model is the exceptional Monaco, a 4,055-square-foot residence with four bedrooms, four full and one half bath, a club room, living room and family room. This is the second Monaco that Mustapick has constructed in the neighborhood; the first sold just two weeks after it became available. The Monaco starts at $1,441,000. Mustapickâs outstanding 3,855-square-foot Marseilles sits on a beautiful, lushly landscaped home site next door. Like the Monaco, it feels wonderfully spacious. The design flows naturally, lending a certain seamlessness to the layout, which features three bedrooms, three full and one half bath, a den and great room that opens on to a covered loggia. Beyond is the swimming pool and a private water feature. The Marseilles is priced from $1,423,000. Courchene Development Corporation also has a number of Golf Estates models, including the 3,485-square-foot Poinciana II. The homeâs traditional split floor plan features three bedrooms, three full and one half bath, a library and a spacious great room that opens onto a covered loggia. To maximize views of the tropical landscaping, the Poinciana II has been designed with plenty of windows and sliding doors for a seamless flow between the indoors and outdoors. 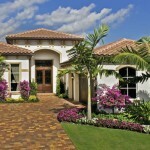 The Poinciana II is priced from $1,245,000 on a standard preserve home site. At the opposite end of the size spectrum in the Golf Estates, thereâs Courcheneâs lovely Chesterfield. The two-story, 5,060-square-foot layout includes four bedrooms, five full and two half baths, a den and a second floor with a loft that is accessible by elevator or stairs. The residence overlooks the green on the third hole of Old Palmâs Raymond Floyd-designed golf course, so the views are stunning, especially from the second floor. Itâs priced from $1,685,000.